Wednesday was my birthday but rather than spend a pleasant evening with my family sharing a slice of cake, I trudged off to Hendon Town Hall to attended a public consultation meeting on the proposed new committee system that the council wants to introduce next April. Sadly, very few member of the public were there - just 17 along with 9 Councillors and numerous Barnet Council staff members. As is the way with these "public consultations", the whole process was heavily stage managed with no off-script questions and no real debate about why we are changing the system. The Council's research indicates to me that the public are largely disengaged with the council. Only 7% of respondents said they had been to any council meeting and more than two thirds of respondents said they didn't even know who was their Councillor. I spoke previously at the Constitution & Ethics Committee about the lack of engagement and the failure of the proposed new system to address that problem which I blogged about here. What are the critical success factors for the new system by which you will measure whether you have achieved your objectives. Now to me these are two both reasonable and fundamental questions which should be clear at the outset of any project. A few awkward looks and then a reply from Richard, "to involve all the Councillors in the running of the council and to make the Full Council meeting meaningful". Both those answers highlight where the problems lie in the proposed new system. 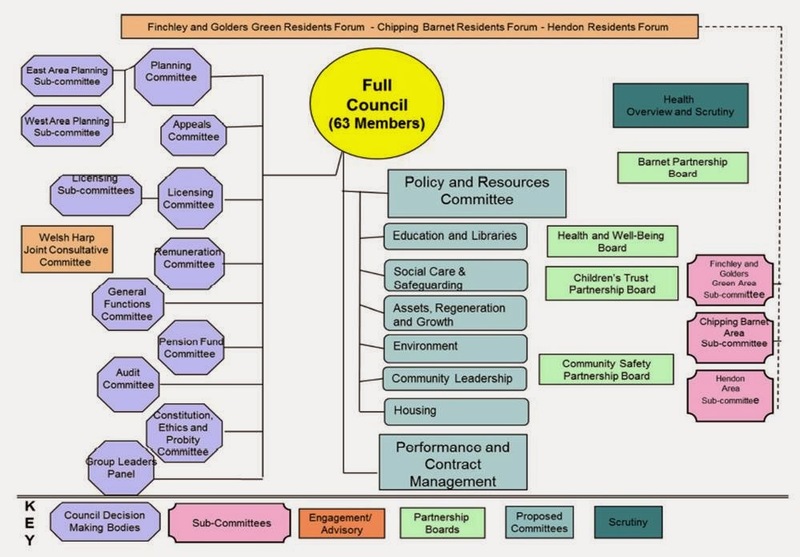 This new system is all about giving the other 53 non cabinet Councillors something to do, otherwise how could they continue to justify the £1 million spent on Councillor allowances each year. By the way if you are not sure how much your Councillor was paid last year I suggest you take a look here. It is very revealing just how many Conservative Councillors are paid more than basic annual allowance of £10,596.96. In fact 75% of all Conservative Councillors receive some form of special allowance for additional duties. As for making the council meeting meaningful. that illustrates what a pantomime it currently is run at significant expense. Several people on my table seemed to think that the skills and experience of Councillors would come to the fore under the new committee system. Sadly I think that will not be allowed to happen under the new system where the ruling group will always want complete control. The chart shown on the evening was slightly different to chart above but it is close enough and there is no electronic version on the new chart available. Feedback from several of the discussion groups was that there was not enough information upon which to make informed decisions, but no surprise there. We shall have to wait and see what transpires at the next Constitution & Ethics Committee meeting in December but how they can base anything meaningful on the views of 17 people that will affect the way the council is run for the next five years is beyond me. Perhaps instead of finding jobs for the boys they could cut the number of Councillors by two thirds and actually make the current system work effectively. At least it would save us around £700,000 a year in Councillor allowances. £16.1 million Capital Investment - Is the picture any more transparent? I refer to your open letter to Councillors dated 8th November 2013. Cllrs Thomas and Rams have asked me to respond, as your letter raises a number of technical matters that I am well placed to explain. In so doing I hope to put your minds, and those of the many readers of your respective blogs, to rest. I’m afraid that you have misunderstood the purpose of the publicly published DPR of the 5th August 2013 and as a result have made a number of incorrect inferences about changes to the business model agreed by Cabinet on the 6th December 2012. You will recall that this was the publicly agreed and published key decision which authorised payments to Capita of £320m over the coming ten years. There has been no subsequent change to the business model, no change in Capita’s investment commitments and no change or reversal in policy. The plan remains as it did on the 6th December 2012. DPR 5th August 2013 did not authorise any payment to Capita. Starting with the DPR of the 5th August 2013, the purpose of this decision was to authorise the inclusion of Capita’s investment in IT and other infrastructure assets into the Councils capital programme. In this regard we are bound by a range of technical accounting standards. In summary, if assets are to be used by the Council, irrespective of who has paid for them or who controls their day to day use (in this instance Capita) then those assets need to be recorded on the Council’s balance sheet. In order for them to be included in the Council’s balance sheet, they first need to appear in the Council’s capital programme – hence the need for the DPR. I would draw your attention to paragraphs 5.2, 5.3 and 5.4 and the report recommendation at paragraph 10.1. As you can see, very clearly, this DPR does not concern itself with ‘the authorisation of a payment to Capita’ or the ‘approval of a payment to Capita’ or as your letter puts it ‘the sanctioning of a payment to Capita’. In fact the DPR had nothing what so ever to do with authorising any payment to Capita, it was simply a technical enabling decision to include Capita’s forthcoming investment into our capital programme. Evidently this needed to take place before the contract was signed, but after the judicial review outcome was known which was why it was agreed when it was. There would have been no point including Capita’s potential investment in the Council’s capital programme while ever that eventuality was in doubt. In short, it’s a red-herring to connect the DPR of 5th August 2013 with any decisions about payments to Capita. The key decision to agree expenditure with Capita was the cabinet decision on the 6th December 2012. In your letter, you collectively assert that Capita is no longer making the investment in the Council’s IT infrastructure, but instead that the investment is coming from Council reserves. You consider this to be: contrary to the business model approved; by Cabinet in December 2012 and contrary to public pronouncements about the benefits of the contract made at the time and subsequently. I can assure that none of these assertions are correct. receive service performance equal to or better than that currently delivered by the Council. This overall business model remains unchanged by payments to Capita since the contract was signed. Payments of the agreed £320m to Capita have been profiled over the ten year contract to maximise savings and service improvements to the Council. In particular, in the first year of the contract, to reduce the cost of capital in Capita’s contract price, £16.1m of the overall £320m was paid on contract award. This is not an additional contribution; it is within the £320m contract sum. Doing so has saved the Council – not Capita – an additional £0.8m. This sum contributed to the additional savings set out in section 9.4 of the published public Cabinet report of November 4th. All decisions about the profile of payments have been made in accordance with the Council’s publicly published financial regulations. For the avoidance of doubt, the profile of payments to Capita have had:No impact on the Council’s reserves. The investments referred to in the business model continue to be made from within the £320m agreed contract sum. Council Reserves have therefore not been used to fund the investment. Reserves have not gone down by £16.1 million. Tax payers are not now paying for something that they thought was being paid for from the contract price and Capita aren’t receiving additional amounts of investment from the Council. In fact as a result of the profiling of payments, tax payers benefit from additional savings. No impact on the Council’s balance sheet. The IT and other infrastructure assets that Capita will be purchasing will be recognised as capital assets on the Council’s balance sheet. As stated above, this is the correct accounting treatment for the assets in these circumstances. It is for this reason, and this reason only, that the intended purchase of IT and other infrastructure assets by Capita are captured in the Council’s Capital Programme. Mr Dix has written to me and other colleagues in the Council about the accounting treatment of these assets and I will respond to him separately in due course. There has been no use of Council reserves to ‘fund this investment’. There is no change to the original business case. As an aside, I don’t recognise your collective point about capped procurement savings. The publicly published contract commits Capita to guarantee the procurement savings already identified by officers in the medium term financial plan. The contract includes a payment by results provision for procurement savings that are identified and delivered by Capita over and above those included within the guarantee – where this is agreed in advance by the Council as the most commercially sensible way to proceed. The contract does not bind the Council to use Capita to deliver procurement savings. Accordingly, in the future, we can make a case by case judgement based on what is most commercially opportune for the Council. In conclusion, I can advise that there has been no change in policy, and no radical change to the terms of the business model agreed by Cabinet on 6th December 2012. Likewise, there has been no decision to use Reserves for a capital investment payment to Capita other than that set out in the agreed £320m contract sum agreed by Cabinet on 6th December 2012. As all payments to Capita have fallen within the contract price agreed by cabinet I cannot share your conclusion that there has been any breach of council regulations. I would be very happy to meet with you to discuss the contents of this letter in more detail. Indeed I am due to meet Mr Dishman and Mr Dix next week to discuss a range of other matters and would very happily add this issue to that agenda. By way of this letter, I extend a similar invitation to Ms Musgrove and Mr Tichborne. In the spirit of openness and transparency, and given that you have all written extensively about these matters on your popular blogs, please could I ask you to publish my response letter in full. “Capita’s proposal also includes (within the financial offer described above) approximately £15.3m revenue investment in areas such as information technology (computer hardware and software), and customer services. This investment not only enables Capita to deliver the transformation it is proposing, but also avoids the Council having to find money in the future to fund replacement technology for systems that are at or nearing the end of their useful life”. “Of the total £320m, £16m of this is paid up-front for the capital investment. The remainder of the service charges are paid quarterly in advance. The reason for making an up-front payment to Capita for capital investment, and for payment of service charges quarterly in advance is that the Council’s “cost of money” – i.e. the amount that it pays for access to cash, is considerably cheaper than Capita’s. The Council has internal reserves, and access to the Public Works Loan Board funding which is closely aligned to the Bank of England base rate. So the up-front capital contribution and quarterly in advance payment reduce the overall cost of the contract to the taxpayer. The council have made a decision to fund the investment instead of Capita and from Mr Naylor’s response in October there is a very clear inference that this would come from reserves or borrowing. “The council agreed to fund the capital costs up front because the council benefits from a lower interest rates which keeps the overall cost of funding CSG as low as possible. The assets are Capita’s, but Capita is obligated to provide them back to the council upon contract termination for at no further cost” - again implying borrowing or lost interest on reserves. “there has been no change in policy, and no radical change to the terms of the business model agreed by Cabinet on 6th December 2012”. Based on the above this would appear to be untrue. Relieving Capita of the obligation to fund £16.1 million of capital investment which impacts the cost of the contract by £800,000 does not appear to fit these criteria. Clarification is needed over the specific issue of the origin of the funding source used by the authority to support the £16.1 million. Mr Naylor asserts in his response that this was not from reserves, yet in his earlier statement he refers to ‘internal reserves’ and the ‘Public Works Loan Board funding’. Was the funding from reserves, or not? Was the funding borrowed, and if so, how much, and does not such an action contradict the position taken by Cabinet member Robert Rams in criticising opposition proposals to borrow money for capital investment? Why have our councillors remained so reluctant to address the questions publicly, and why has the Leader of the Council remained silent on an issue of such public concern? There are further unanswered questions about the authorisation signed by Leader Richard Cornelius on August 5th. Why is a decision, which is not a decision, listed as a ‘non key decision’? Why are there no background papers listed for this document? What exactly are the ‘international financial reporting standards’ to which the document refers? If this authorisation was merely a technicality, why was it necessary for the Leader to approve it, rather than a senior officer acting under delegated powers? Were the backbench Conservative members aware that the funding of the capital investment was not in fact an ‘upfront’ payment from Capita, but to be undertaken by the council? If they were, why have so many statements been made seeming to imply the contrary? 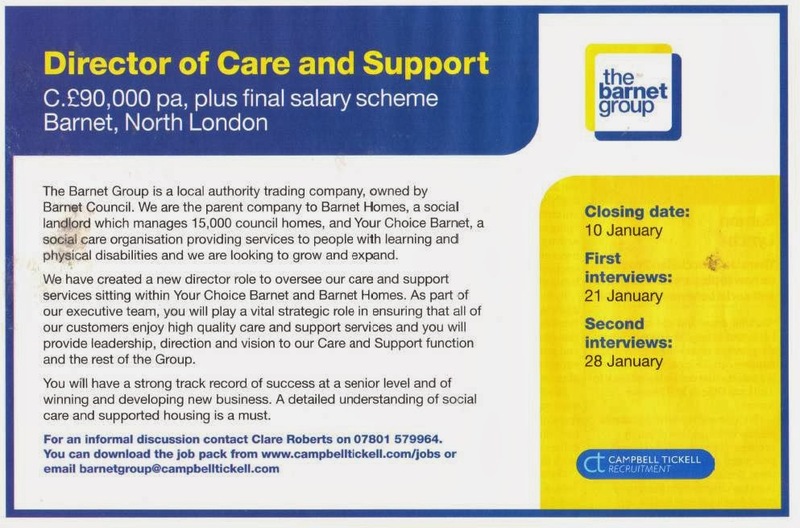 Is the truth that although the method of funding the investment this way was arranged between Barnet and Capita, for reasons of political sensitivity the Conservative administration has failed properly to explain this to backbench members or the residents of this borough? Is it fair to suggest, as the Labour leader Alison Moore commented at last week’s Cabinet meeting, that the way in which the funding has been arranged would appear to involve a ‘sleight of hand’, and is this really compliant with the principles of transparency, accountability and open government, and the duty to protect the best interests of the residents and tax payers of this borough? It is clear that there are still many serious outstanding questions left unresolved and for this reason we repeat our call for an immediate investigation into the issue so as to ensure that our elected representatives are fulfilling their roles in the proper scrutiny of the actions of this council. Mr Reasonable is happy to post this press release from the Brent Cross Coalition. 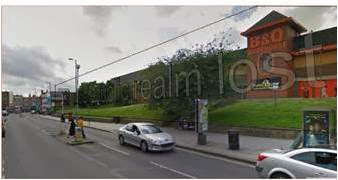 The Coalition for a Sustainable Brent Cross Development has learned that under revised plans to go before Barnet planning committee in January 2014 the green space outside B&Q will be built over in Phase one. Despite Cricklewood Town Team having popular plans to plant trees and utilise part of the space for a market in the short term, this green space has been parcelled up and sold for high density development as part of the Brent Cross Cricklewood development over a mile away. The green space on Cricklewood Lane will be covered by a five storey building, right up to the pavement line. Phase one could begin within 3 years. Lesley Turner, Barnet resident and BXC coalition member says "This green space was given to Cricklewood community at the end of the eighties, as compensation or section 106 planning gain, when Food Giant (now B&Q) was built on the site. The Green does not belong to Barnet but to Cricklewood and we have asked Barnet to see the original 106 agreement. We will be challenging Barnet over the legality of the disposal or change of use of this land. Lia Colacicco Mapesbury resident and member of the BXC coalition added “Cricklewood Town Team identified that Cricklewood needs a landmark at its centre, and a town square. The Green Isle is our only public space, used for the Silk Road festival and other community events and now it will be snatched from us. This piece of land is totally unrelated to the BXC development a couple of miles away, but has been wrapped up with it to gain outline planning permission. It is a generic piece of land to the developers, but means everything to us and needs to be unwrapped from BXC, or become the subject of a land swap. The site might not be pretty now, but look at how Mapesbury Dell has been transformed. Once excavated it would be a real asset to the community as a plaza or other open space. Fiona Colgan from the Groves Community Action Group said "my neighbours and I have written to our councillors and MP to strongly oppose the plan to build on our only local green space. Accommodation in the Groves is very high density and Cricklewood Lane gets very congested and polluted so this green space is particularly important to us but it's clear that everyone in Cricklewood would benefit if this land was retained as our 'town green’ at the heart of our community. I think Barnet needs to explain why the green space in front of B&Q wasn’t included in its calculations of green space2. Those of us who live in this part of the borough often feel overlooked by Barnet who do not seem to realise that we need green space as much as those who live in the wealthier, leafier parts of the borough to the North. 1. The “Coalition for a Sustainable Brent Cross Cricklewood Plan” comprises twelve residents’ associations plus the Federation of Residents’ Associations in Barnet (representing the 12 largest residents’ associations in Barnet), Brent Cyclists, the North West London Light Railway (NWLLR) group, Brent Friends of the Earth (FoE), Barnet & Enfield FoE, Camden FoE, Sarah Teather (MP for Brent Central), Dawn Butler, (former MP for Brent South), Labour and LibDem Councillors from Brent and Camden, Navin Shah (London Assembly Member for Brent and Harrow), Darren Johnson (London Assembly Member), Jean Lambert (London MEP), Brent Green Party, Barnet Green Party, Brent and Barnet Trades Union Councils, and Bestway Group. 2. Consultation on Tuesday 12 and Wednesday 13 November from 11am to 8pm at Hendon Leisure Centre, Marble Drive, NW2 1XQ. Comments need to be sent to nicola.capeli@barnet.gov.uk by 6th December (giving your name and address). Moral Bankruptcy - Is it becoming the new norm? The current government keeps talking about the need for austerity cuts. Nobody wants waste but we seem to have reached a point where actions, which in the past would have been deemed immoral are now considered necessary in the name of austerity. I have read numerous accounts of people who have been "sanctioned" by their local job centre resulting in the loss of benefit, frequently for very minor or trivial reasons. These people end up losing benefit and face incredible hardship and as a result are dependent of food banks to eat. While I am a great believer in the principle that if you can work you should, I know of people who, for example, have mental health problems being persecuted for failing to meet every single requirement of the system. We used to have Remploy factories where people could take work that was appropriate for their skills but they have all been closed. The Office of National Statistics says there are approximately 2.5 million unemployed people but when you look in more depth at the figures you find that there are almost 9 million economically inactive people aged 16-64 in the UK. There are still huge numbers of applicants chasing every job yet people seem to be expected to get a job immediately and if they don't they are labelled "shirkers". Persecution of the poor and unemployed seems relentless. But what I have seen in the last few days is even worst; an all out attacked of the most disadvantaged in our society.On Friday, I read with incredulity, that in Barnet, social workers working in Learning Disabilities have been set a series of targets including one which requires each social worker to make savings of £42,000 on service user care packages they assess this year. This is going too far. I understand that the cost of social care is high but I have no problem paying my taxes to fund this because that is the sort of society I want to live in, one which is fair, equitable and which cares for those who need it. Yet as the same time as I see demands for these savings, I see the massive Trans National Corporations like Amazon, Google and Vodafone getting away with paying little or no tax, making limited contribution to our society. I met a chap not that long ago who had used very skilled and expensive accountants to help him avoid a tax bill of £50 million. I would stress that he had done absolutely nothing illegal but that his money had allowed him to secure the brains of the best people to help him use completely legal ways to avoid paying that tax. My view was this was morally wrong but I was seen as an eccentric for challenging why he had not paid the tax. In Britain we have to decide whether we want a decent society and be prepared to pay for it or accept that the weak may suffer but that is ok because it is cheaper. Maybe I'm old fashioned, maybe I am eccentric but I believe that to some extent over the last 15 years and certainly in the last three year we have lost our moral compass. We face the slippery slope of accepting the iniquitous in the name of austerity and I am terrified as where it will end. My late father was brought up in abject poverty, his father having been killed in the first world war. He used to recount to me how tough times were and how for a period he was put into care because his mother could not afford to feed or clothe them. He believed that he had fought in the second world war for a fairer society where that type of inequality would never be seen again. With the growth in food banks, with cuts in services to the most vulnerable, with wages being cut thanks to outsourcing, with housing becoming completely unaffordable, I fear we will see those desperate times again. Morality versus austerity, there has to be another way. Did Barnet pay £2 million for the new recycling bin lorries? Barnet's Supplier payments for September are out. No large payments to Capita this month but having being paid over £30 million in the last couple of months I think they have had more than enough already. Following a relatively modest billing £106,001.10 in July and £120,801.60 in August, Agilisys bounced back with a £292,640.83 in September. Given we now have Capita running Barnet I find it puzzling why we are still spending more than a quarter of a million pounds a month on consultants to implement One Barnet. A couple of payments which did catch my eye are for just over £2 million pounds payable to Go Plant Ltd who supply refuse vehicles to the Council and are based at the Brittacy Hill depot at Mill Hill.. The payments are for "Equipment and Materials Purchase" and attributed to the Environment and Operations department. I am investigating this further but I wonder if this is to pay for the lovely new recycling bin lorries. If it is, it will take the total bill for the new recycling system to just under £6 million. Barnet still paid over £1 million for temporary staff in September which seems shocking given we have Capita in place. 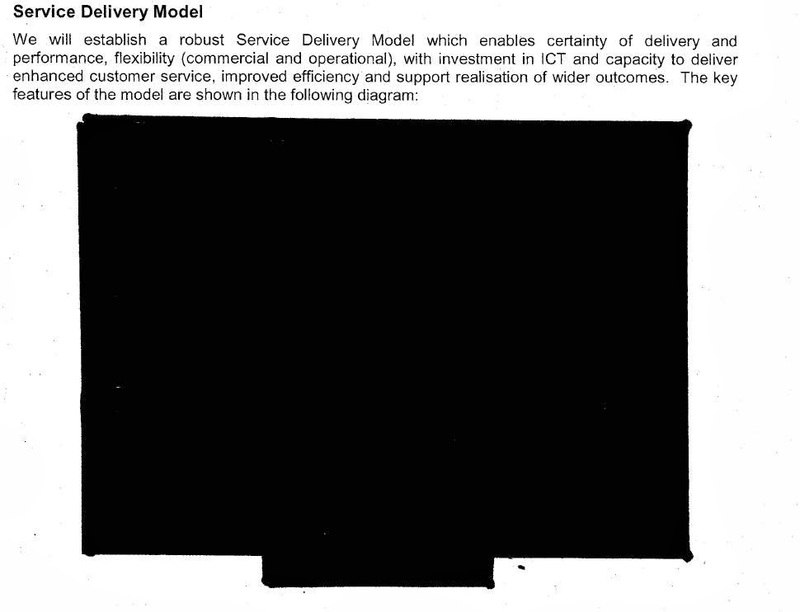 What does Capita's service delivery model in Barnet look like? The Service Delivery Model sets out how Capita will deliver their services under the development and regulatory contract. This is what it looks like in the published contract. Is this openness and transparency?